So, you did it! You finally made the big decision and retired! Boy, oh boy, do you have a list of stuff you want to do and a list of stuff you don’t have to do anymore! Some folks have planned for this day for years and others just had a moment when they were at work and just decided on the spur of the moment “I’m done,” as they gave their boss a two-week notice. After meeting with thousands of retirees, we see happy folks, and, believe it or not, some unhappy folks. I was assisting Michael (a pilot) with his retirement plan, and he was lamenting that at 65 there was a mandatory retirement for pilots at his company. He loved to fly and was still in great health and he was unhappy to be retiring. He went back to school and got his instructor’s license so that he could now teach, which will allow him to continue to fly! Another retiree, Renee, said she was unhappy because once she retired she lost focus. Until retiring, she didn’t realize how much of a routine she had been in and how much of her life was spent involving her career. She now had lots of free time and wasn’t quite sure how to fill it. She had fallen into sleeping late and not being very enthusiastic about getting out of the house and doing activities. She had a list of “stuff” she wanted to do but realized that all the items on her list had something to do with work. Now that she was retired, her list was obsolete. 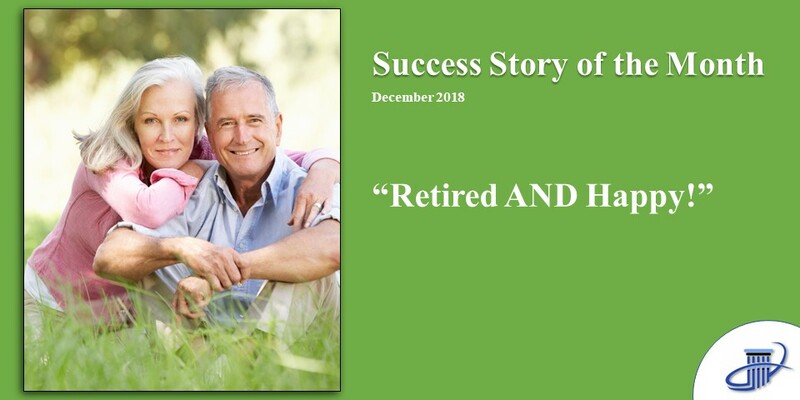 Another client, Benny, had a funny reaction to retirement in that he said he felt for the first time in his life he might be deemed a loser, because now when people asked, ‘what do you do,’ he had no answer. He felt funny saying ‘I’m retired and don’t do anything’. For the first time in his life he had no responsibilities. He simply said, “It’s weird”. Most folks are thrilled they are retired and can’t wait to play golf, travel, and spend more time with the grandkids! Many are turning to teaching or volunteering and feeling useful in our society. Some love the fact that they can now spend time on a favorite hobby. One client had a 1969 Corvette stored in his garage for the last ten years just waiting for him to retire and rebuild. He couldn’t wait to get started on fixing up his baby! Being happy in retirement isn’t just about money. It more about what your life is going to be about while in retirement, and how to make yourself happy. You do want to be somewhat worry-free about medical and financial concerns, but sometimes you just need someone to assist you with an overview of what exactly will your retirement look like? So, if you have questions about retirement, Medicare plan selection, Social Security benefit questions, or anything that has to do with retirement? Call us!